This section of the Big Walks Club Website is dedicated to the systematic climbing and ticking off of summits from the list of the Scottish 3000ft mountains, a pursuit which has now been branded "Munro Bagging". This pursuit dates back to 1891, initiated by Sir Hugh T Munro, who published the first Munro Tables. Recent years have seen a massive increase in popularity of Munro bagging and the list of completees now stands at over 5000. After many years of nibbling at the edges of the Munros, I finally committed in 2008 to try and complete a Munro round. Why bother you may ask - just enjoy the hills and don't get obsessed with ticking off the list. Well until I started I was pretty much of this opinion. Now having compleated them I can really see what the attraction is and why it really gets under your skin. The challenge of the Munros is massive - don't let anybody belittle the effort required to do all 282 peaks. It organises the exploration of the Scottish highlands in such a way that it forces you to go and search out places you would never of thought of going to and gradually over the time taken to compleation, a mental map of the Highlands will be embedded in the brain. Moving from one range of mountains to the next gives a reciprocal view so as to map out by triangulation in your own psyche this wonderful countryside. So I really enjoyed the sheer volume of experience gained from the exploration of the truly magical places of these magnificent hills. There were two main literary sources of information for my Munro planning. These were The Munros - Scotlands Highest Mountains by Cameron McNeish and The Munros in Winter by Martin Moran. Cameron's book is an excellent guide book to help organise the required trips to the hills. It is really well set out and mountains are sensibly linked together rather than taken as individuals, as in the case of the SMC Munro guide book. 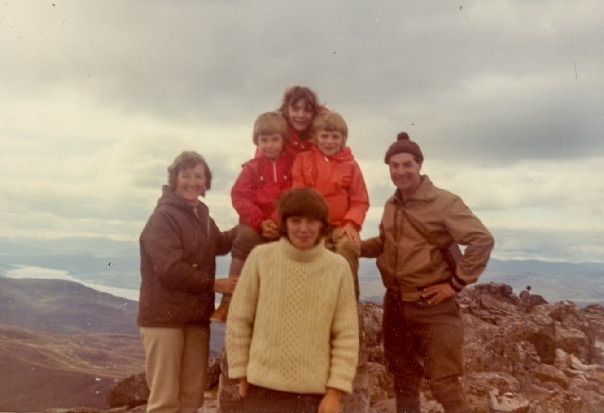 Martin's book is a description of his epic ascent of all the Munros in the Winter of 1984. Its is an excellent read - really well written, very enjoyable and highly recommended. It also can be used as well to help plan multi-peak days in the mountains. What Martin manages to do in a day in Winter I can just about do in a Summer day so this speaks volumes for the speed that he must have travelled over the hills. In terms of information available through the internet, the best site by far has been set up by Steven Fallon. Steven has completed the Munros each year for more than 10 years and has clearly a vast knowledge of the routes and route planning for days out in the Scottish peaks. His website has an amazing amount of information on it and was the primary source of route information for most of my Munro campaign. Thanks Steven! The combination of these three sources plus some further pouring over OS maps has been sufficient to ensure the efficient use of time in the hills. I have grouped my walks into the mountain groups given in Cameron's book starting in the South then working West, North then East. A list of the Munros, with links to the information on the routes taken to each of summits, is given in the Munros completed page. The initial area of the Munro campaign was the Southern Highlands. This was taken as the area from Loch Lomond in the south to Ben Nevis in the north and bounded by the Lawers Group in the East. All the major groups of mountains in this area were completed by 2009. After this I concentrated on the North West Highlands and the Far North and this area was pretty much complete by the end of 2012. The final phase of my Munro journey covered the Eastern Hills and these were compleated by October 2015. If you attempting the Munros yourself I hope you find the pictures and information useful and enjoyable. Drop me a email so we can compare notes or even meet up for a Munro bagging trip sometime.